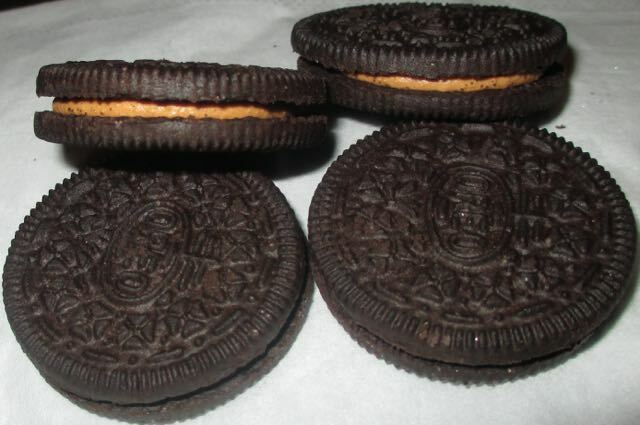 I am a big fan of the American Peanut Butter Oreos, and have spend a small fortune picking them up from import shops. 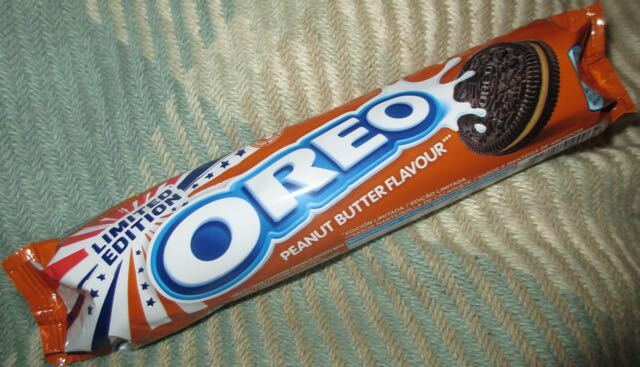 When I heard that they were releasing Peanut Butter Oreos her in the UK I can’t tell you how excited I was. Subtle as it is though, there is a slight name change for the Uk product. 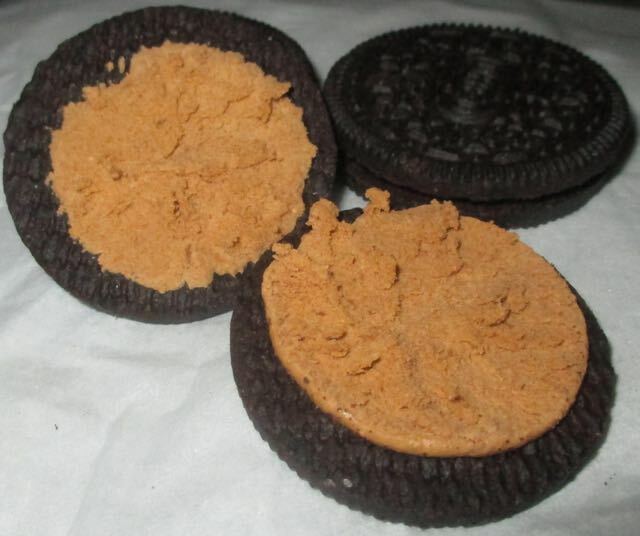 These are Peanut Butter “Flavour” Oreos. The word “flavour” can cover a lot of sins, including not actually including the aforementioned ingredient. Strawberry flavour means it foens’t need to list strawberries in the ingredient list, this is apparently true with Peanut Butter Flavour too, these are a nut free recipe. Do they do a convincing job of pretending to be peanut butter? Yes they do, they are actually really tasty. All the flavour of the salty nutty goodness is there. Mixed with the biscuit it does recreate almost perfectly one of my favourite import products. Dark chocolate biscuit, nutty taste, it all works so very well. The texture doesn’t have the stickiness, but you would only really notice that if you split the biscuits and went straight for it. I just don’t understand why there isn’t any peanut butter in them? It must have taken a lot of trouble and flavourings to recreate peanut butter, without using the actual nuts. 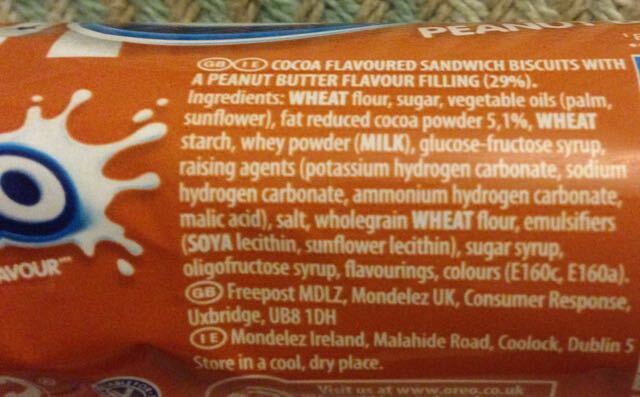 Why not just use real peanut butter, like the American biscuits? Is this to do with cost saving, or nut allergies? I don’t think it can be the latter because I think someone with a nut allergy would take a lot of persuading to eat even ‘peanut butter flavour’. Nut free peanut butter, what will they think of next? I found these pretty disappointing if I'm honest, not a great peanut butter flavour and the biscuit was a bit bland and bitter. Really want to try the American ones though! There are 2 different US Oreo Peanut butter varieties, the regular & Reeces. Has any one compared them? I brought a couple of bags of the Reeces ones back from the States this year & they were delicious.